It's signed and inscribed, "For the marvellous Mrs. Gifford!" 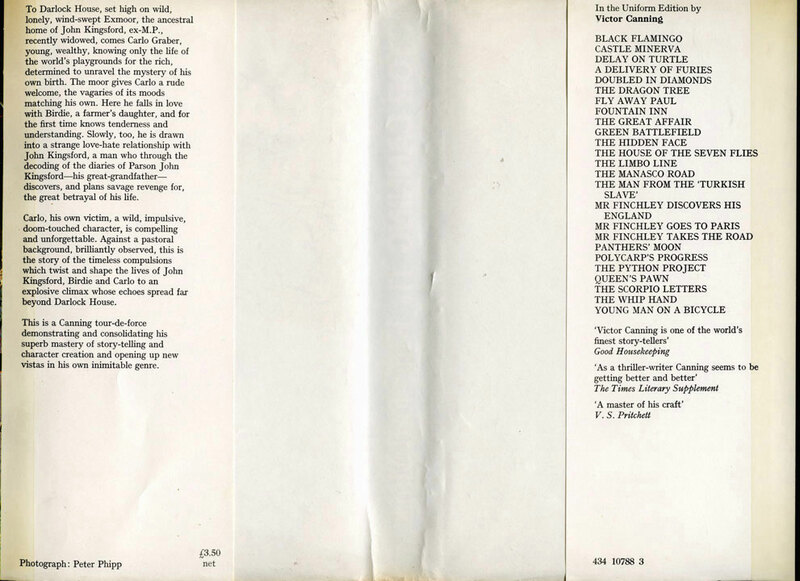 – possibly; I can't make out the name – "With the author's admiration! Victor Canning, Sept. 75." I suspect Badger's Books might not have grasped quite what they had on their hands, hence the low asking price; Canning's signature isn't instantly recognisable, so perhaps it was dismissed as an owner inscription rather than an author one. I must admit that at the time I too almost dismissed it as such, but then realised what it might be and decided to take a chance on it. 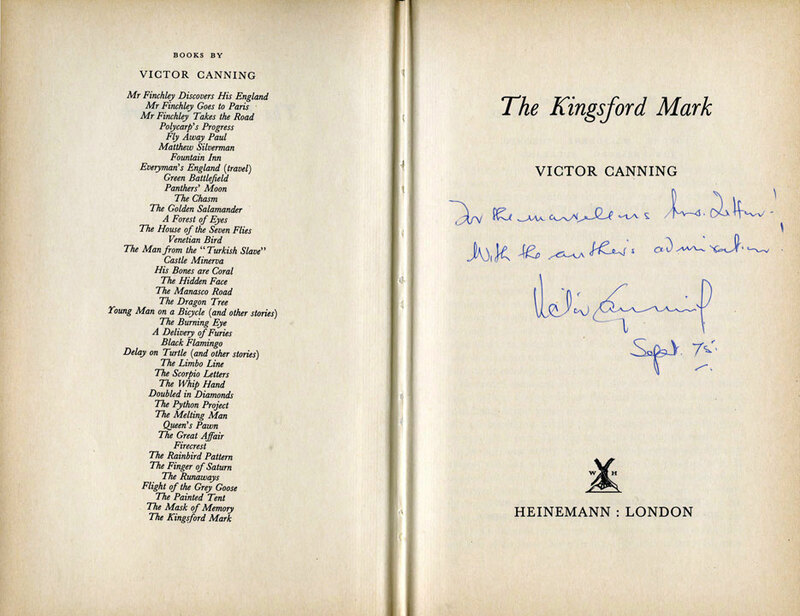 I've since ascertained that it is indeed Canning's hand – I have something to compare it to, which I'll reveal down the line – and that signed Canning books are very uncommon: I can only see four such items on AbeBooks at present. 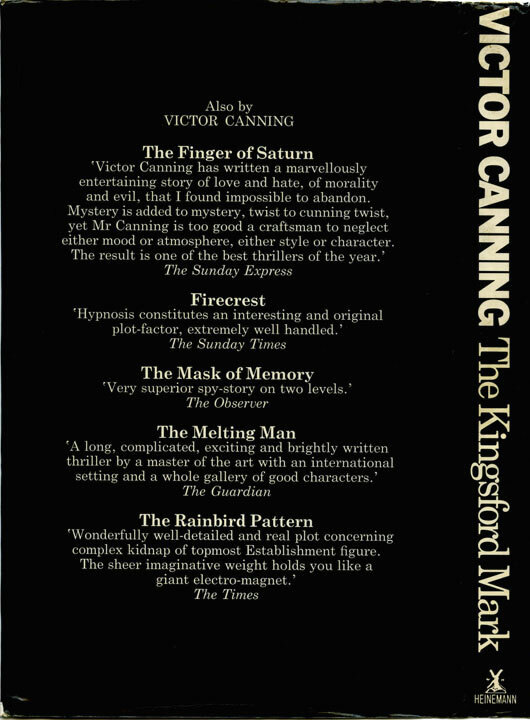 By far the best place on the web to read about The Kingsford Mark, and Victor Canning in general, is John Higgins's Victor Canning pages, which is the kind of exhaustive site one wishes all forgotten, overlooked or otherwise under-appreciated authors could lay claim to. John left a comment on my Val Biro/Victor Canning post back in 2012 and I've been dipping in and out of his site ever since. I've become especially interested in Canning's "Birdcage" books, a series of espionage novels Canning wrote in the latter stages of his life and career centring on the activities of a nefarious government dirty tricks department – a series which John actually answered questions on on Mastermind in 2009. 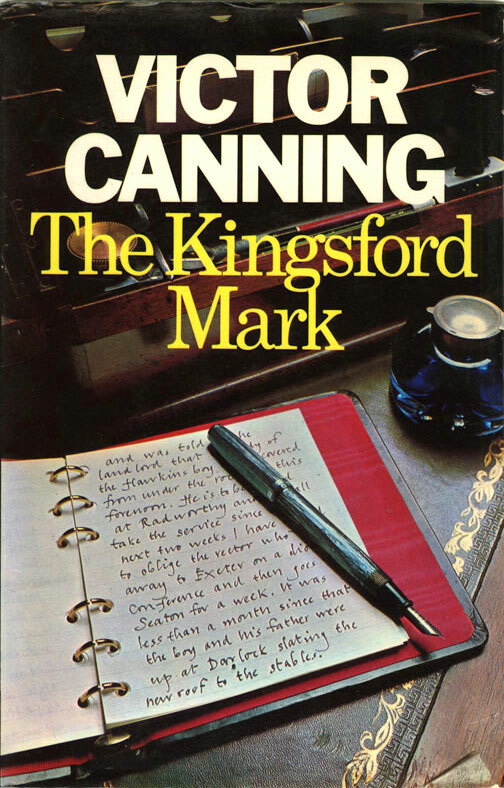 The Kingsford Mark, as John notes in his entry on the novel, "is not a Birdcage book, but the authority figures, Wardle and Grainger, have a great deal in common with the Birdcage secret department which features in most of the other thrillers Canning wrote in the 1970s and '80s". And I'll be exploring some of those thrillers over the course of forthcoming posts. My previous comment must have fallen foul of your anti-robot software. Lets see if this gets through. Yes, the signature is genuine and the inscription is fairly typical. There are not that many signed books around. Among the the ones I own or have seen, most say "with love" or "with thanks for a delicious lunch", so they are not from book signings. My favourite is one he wrote for Alex Graham, the Daily Mail cartoonist: "with the author's profound respect for his prowess at golf, April 1960". His daughter told me that Canning and Alex Graham belonged to a four that played regularly at Rye Golf Club, competing for a "cup" that consisted of an old Nescafe tin that changed hands week by week. Excellent, thanks for that John. I don't know if you've noticed but I've posted another signed Canning since this one – flat signed this time.